6719631: 2010-2013 Toyota Tundra (Not Platinum or Limited) X METAL Custom Black Mesh Chrome Studded Grille. T Rex Grilles is the leader in cutting edge custom grille designs and has done it again with the new X METAL Series Grilles. Starting with top quality stainless steel, T Rex assembles a proprietry wire mesh into a precision laser cut frame surround. The entire grille is then powder coated black. Then, attractive chrome studs are added to give it that unique custom look that says: "there is no other truck like this in my neighborhood!" Set yourself apart with the latest in high quality custom grilles from T Rex Grilles. Comes complete with hardware and instructions. OE factory grille requires modification. Installation time is about 1hr. X METAL badge may be removed if desired. 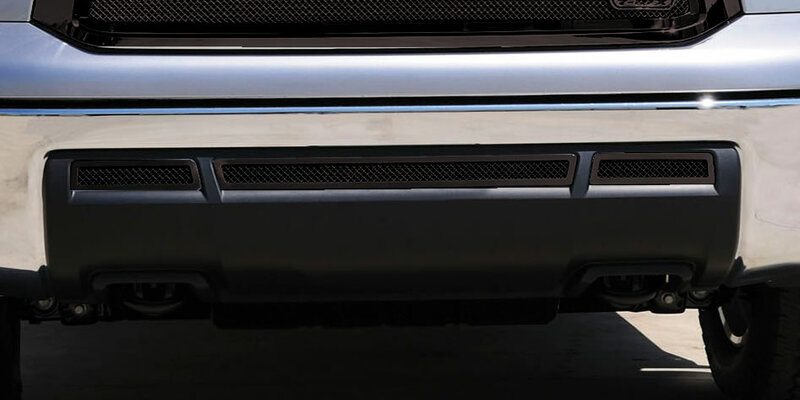 Black three piece bumper grilles are also available above as optional item. Backed by manufacturers limited lifetime warranty. Made in USA. Tell your friends about the X METAL Custom Black Mesh Chrome Studded Grille. Share this product on Facebook, Twitter, MySpace or send an email to a friend!